Read through as many guide books as you want and you’ll see that the items of interest for Cologne are a lot shorter than some of the other more popular cities in Germany. But here are the best attractions I’ve found for kids (besides the zoo) that can even be done all in the same day that you don’t want to miss. The Dom (The Cathedral) is an impressive structure both inside and out. 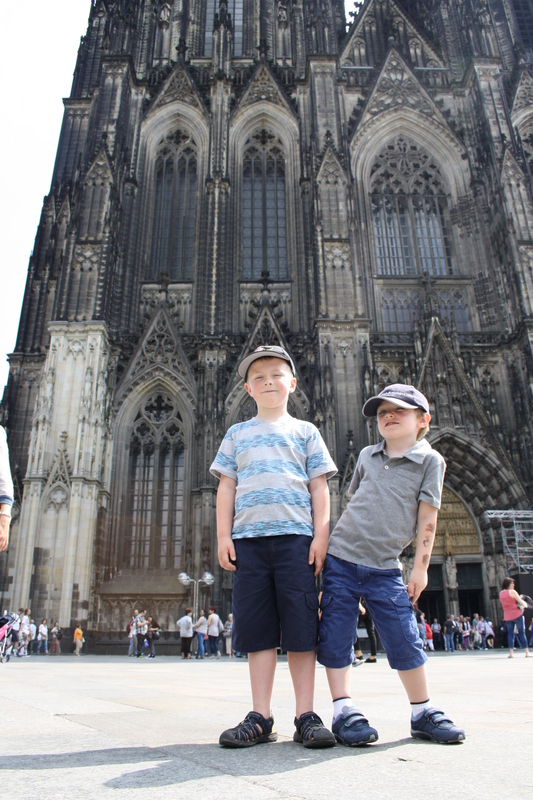 It is the icon of the city and conveniently located right next to the main train station so if you only had a stop in Cologne for a couple hours on your route to another destination, you could easily take in this gem and let the kids stretch their legs. We failed to visit this museum while we lived in the Cologne/Bonn area. Not for the lack of trying though! You really have to check their website to be sure they are open on the day and time you plan to visit. Rick Steves can be great, but he doesn’t give this museum a very positive review, which is one of the reasons we never ensured that we made it there while living in Cologne. However, I found it to be gem for children, beyond the obvious chocolate. My two boys were dazzled by the hands on maps and interactive exhibits on growing and processing the cacao bean, well before we even got to the part of making it into the chocolate and the free sample. The machinery on display was even more fascinating as they followed how the gears and wheels turned to move the machines that would help in the making of one of their favorite treats. You can view their website (in German) here http://www.schokoladenmuseum.de/start.html then just right click on your mouse to have your browser translate it to English. 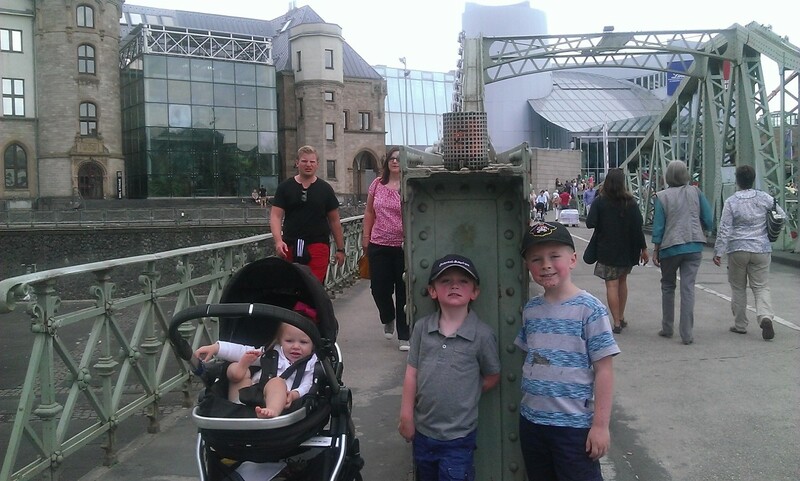 Standing in front of the bridge that leads to both the Chocolate Museum (Schokoladenmuseum) and the German Sport and Olympic Museum (Deutsches Sport und Olympia Museum). This museum was made with kids in mind! There was an old fashion gymnastics apparatus station for them to climb on, a track to practice running a sprint race, and many other interactive exhibits that made this museum fun for the whole family. There were also several videos as well as pictures and memorabilia documenting the triumphs and defeats of German sports teams and stars through the centuries. The only thing that lured them out of the museum was the promise of the chocolate samples in the Chocolate Museum that was directly next door! For more information, check out their website http://www.sportmuseum.de/index.php It is in German, but again, having your browser change it to English will give you a good enough idea for the general information. 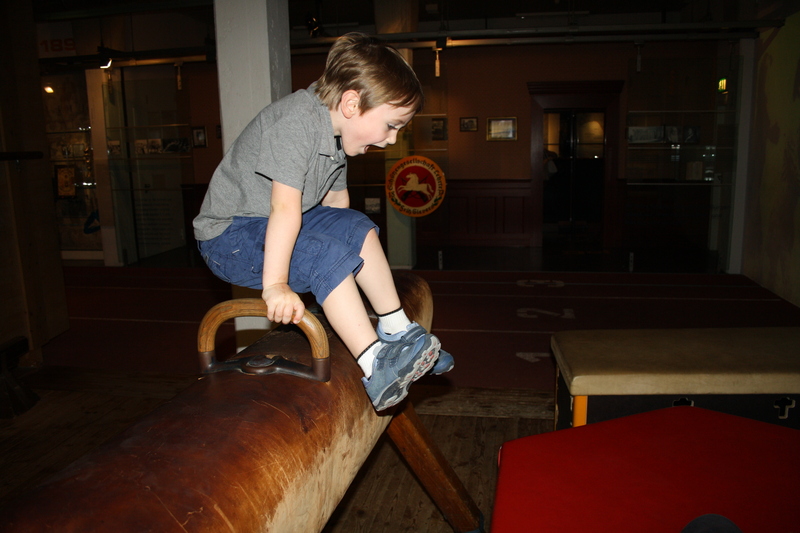 Playing on an old pommel horse at the German Sports & Olympic Museum.